Mike Kaul, a western Wyoming native, started fly fishing at age 8 under the tutelage of his grandfather on the renowned Green and New Fork Rivers. He has taken every opportunity in the past 48 years to cast a fly to wily trout that inhabit the many streams around Pinedale, which flow from the Wind River Mountains. Mike has studied and practiced the craft of fly fishing and has introduced the sport to many individuals over the years. 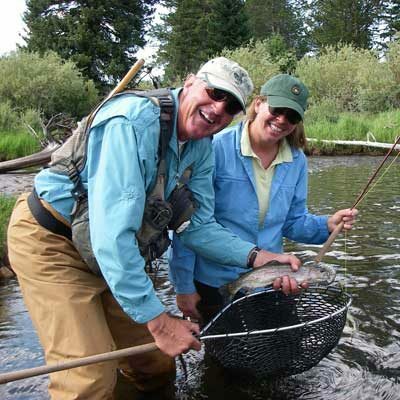 He is a Federation of Fly Fishers Certified casting instructor and conducts a fly fishing school in the Pinedale. Mike specializes in wade fishing and enjoys working with beginners and introducing them to the delights of stalking trout along a beautiful stream bank. He feels the ultimate fly fishing experience is moving along a pristine trout stream, finding a shy trout, choosing the right fly, making the correct approach, executing a well-placed cast, seeing the bubble and feeling the tug of a feisty trout on the line. Fishing with Mike you will learn a lot about wade fish tactics and, most importantly, enjoy the magnificent solace of a high mountain trout stream.